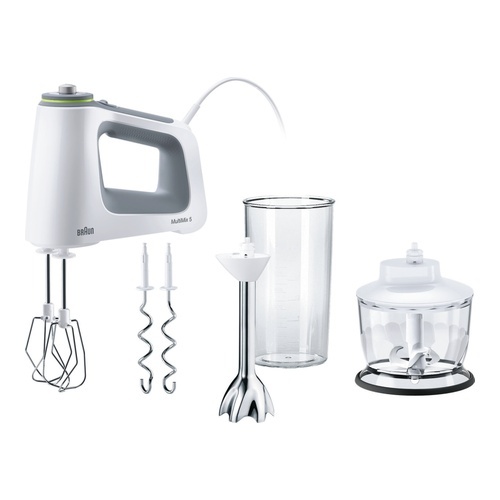 The MultiMix 5 hand mixer easily whips, beats and stirs eggs and mixes cakes, muffins and homemade dessert. The Smart Mix technology makes sure that the weight is directed into the bowl and not in your hand, giving you up to 40% less effort while mixing. The hand mixer has an extra long cord for better freedom of movement. With the VarioControl, you are just one twist away with the thumb to get from speed 1 to 9. Along with the hand mixer, you get a chopper to chop meat, hard cheese, nuts, herbs and carrots in seconds and a stick blender. 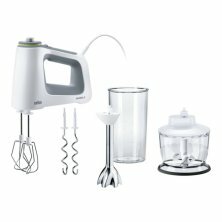 The MultiMix 5 hand mixer easily whips, beats and stirs eggs and mixes cakes, muffins and homemade dessert. The Smart Mix technology makes sure that the weight is directed into the bowl and not in your hand, giving you up to 40% less effort while mixing.